Apart dragging this Monarch out from storage, taking it apart, cleaning it, repainting it and putting it back together in good working order, and trying to get a much-neglected Imperial 66 operational again, I have received four typewriters already this week, and Wednesday is only just dawning. One more Remington portable is due to arrive today. Ah, the wonders of the typosphere! How nice that one silveriz/sed SG1 -- which I'm looking at right now atop a piece of furniture in Ohio -- can inspire the purplis/zation of a Remington in Canberra. And although I'm not usually a big fan of '60s design, I have to say it looks wonderful! Wow! That black Torpedo is gorgeous! Nice work on the Monarch by the way. Looks great. Thank you Richard and Scott. Yes, I agree, the Typosphere is a truly wondrous place, capable of all sorts of inspiration, motivation and realis/zation. I met Scott Kernaghan through the Typosphere, and now Australia's first Type-In beckons. I may bring one of these machines with me. Please keep up the neat ideas, you two! Great job on the Monarch. 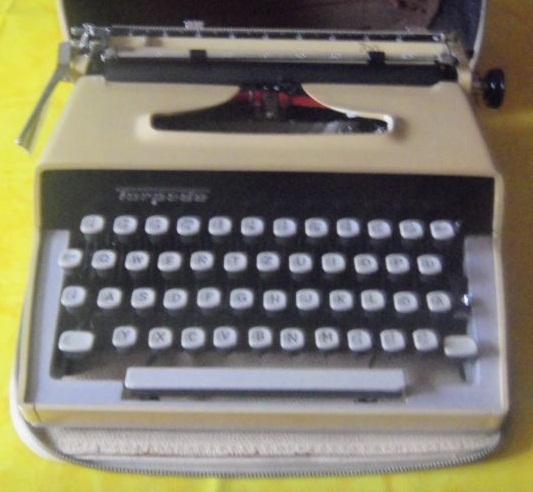 Those other typewriters look very nice. Thank you Bill. The Underwood 3 is one of those rare things, bought in the 20s in Sydney, left in its case, put in a cupboard and left untouched for probably 80 years or more. Not a single scratch on it! The case unmarked, too. And the Torpedo has such a big font for so small a machine. Ten characters to the inch, but it looks more like 14-point. I look forward to posting on it. The purple looks almost like a factory finish and it goes well with the rest of the trim and decals - good choice. And maybe the Underwood 3 bank didn't have such an easy life, it has seen some action going from the indentations on the platen. Those Underwood 3-Bans are small machines. I think they look great, too. Still on the hunt for one. Drool... plus purple fits the King.